A: The Chromira prints on virtually all RA4 photographic materials, both paper and film. A: No, B& W materials are not compatible but Chromira Printers make beautiful B&W prints on color media. A: Chromira does not plug in like a desktop printer. Chromira has a built in Windows XP Workstation computer, which connects to other computer(s) over the network much like any other PC. Files travel over the network to Chromira as they are being printed. Everything needed to interface to the network is included with Chromira. The lab needs only to supply the network cable to plug into Chromira. Q: Chromira has a built-in Windows XP computer, can we store our images there? A: Yes, but it is not recommended. Digital image files can be quite large. The Chromira is designed so that it prints images from files stored on the network. It is not necessary to move an image file to the computer embedded within the Chromira prior to printing. The Chromira can retrieve the image from wherever it resides on the network, as it is needed for printing. A: Chromira does not absolutely require a network to operate. Files can be printed from CDs or DVDs, as well as being received over a network. Q: Since Chromira is PC-based, how can I print images from my MAC? A: Chromira 30 prints at approximately 25 inches per minute for images a full 30″ wide depending on the scaling and rotating of the image. Narrower images may print slightly faster. With prints that are not being reduced in size, or rotated, Chromira prints at full speed. Large files, being printed at a reduced size, can slow down Chromira due to the required data processing time. Similarly, heavy network traffic can delay access to a file to be printed. That could cause Chromira to pause briefly for data. 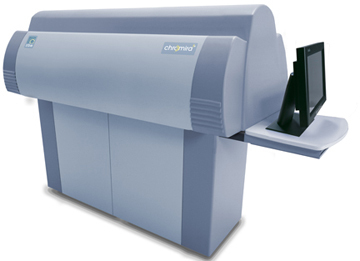 A: The Chromira 30 accepts paper widths as small as eight inches and as large as 30″. Q: How can I print images larger than 30″ wide on the Chromira 30? A: Images larger than 30″ wide (depending on the Chromira model) can be printed in strips. A: You can queue up as many prints as you like. Chromira can print an entire roll of paper, unattended. When the roll runs out, the printer stops and waits for a new roll. A: To print with LEDs it is necessary to have Red, Green and Blue LEDs. Rumors of a 4th black LED are not true. ZBE’s precision control circuitry allows Dmax to be attained using Red Green & Blue only, without the need for the black LED.